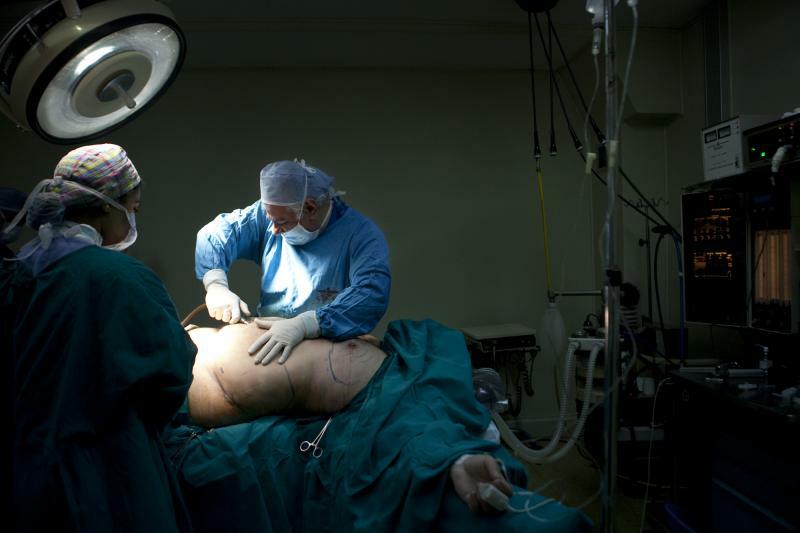 Bariatric Surgery, is a term reserved for surgery on morbidly obese patients. In such patients, the Body Mass Index is >45. You can calculate your body mass index by dividing your weight (in kilogragms) by the square of your height (in metres); i.e. Weight/(height x height). If that ratio exceeds an absolute number of 45, then you are morbidly obese, and you will probably need a bariatric surgical solution. In some instances, a whole body liposuction or extended abdominoplasty may be performed instead, provided the excess fat is localized in well defined areas. 2-Making your intestine unable to absorb the food. Due to the high complications and unpredictable outcome of the second procedure, Dr. Wilson performs only the first procedure. To achieve maximum results after a bariatric surgery you should incorporate a healthy lifestyle that includes a balanced diet and an exercise program into your life. Patients with high body mass index are vulnerable to many risks including 1-higher incidence of heart trouble, 2-higher incidence of diabetes, 3-higher incidence of gall bladder stones, 4-higher incidence of knee osteoarthritis, 5-higher incidence of breast cancer (since fat cells activate more estrogen), 6-and a overall higher mortality rate than the general population. For all such reasons, bariatric surgery is not performed only for cosmetic reasons, but to improve the general health of the patient and reduce the medical illnesses he/she may be subjected to. Am I a good candidate for a Bariatric Surgery? If you are in good physical and mental health with reasonable expectations you should be an appropriate candidate. Following the surgery, you should know that it will take several months for you to lose the excess weight you gathered over the years, and that it will be almost 1 year before you reach a stable weight. Presence of other medical illnesses such as diabetes or heart disease makes this surgery more risky, and Dr. Wilson will review all of your surgical options at the time of your consultation. surgery, its limitations and risks, and discuss your needs and concerns. Dr. Wilson will explain how he will make your stomach smaller, so that you will feel satisfied after a small meal. He will advise you on the dietary regulation after the surgery so that you can get all your nutritional needs from a small meal. Dr. Wilson will also advise you on the follow up protocol, and depending on the quality of your skin tone and the contour of your body, he will discuss the possibility of a body lift being carried out after your weight stabilizes. He will explain which surgical techniques are most appropriate for you and photographs will be taken. How is a Bariatric Surgery performed? There are many types of bariatric surgeries performed. Dr. Wilson will determine which is best for you at the time of the initial consultation. Dr. Wilson performs only the surgeries that reduce the size of the stomach. This surgery can be done by a band that makes the stomach smaller. The restriction of the stomach can be adjusted by addition or removal of saline through a port placed just under the skin. This operation can be performed laparoscopically, and is commonly referred to as a "lap band." Alternately, part of the stomach may be removed to reduce its size (see next page). Although with modern techniques, the complications of surgery are markedly reduced, this still remains a major surgical procedure. Risks include dislodgement of the gastric band, anastomotic leakage, and failure to lose weight. In patients who lose weight, careful nutritional monitoring is necessary to avoid malnutritional problems. Following weight loss, the fat goes away, but the skin does not! In fact it can get more redundant, and this may necessitate a whole body lift after the weight stabilizes. Gastric Bypass in a 28-year old female: She lost 28 kgs. over 6 months, and skin tone was acceptable. Gastric Banding in a 46-year old female: She lost 35 kgs over 6 months, but the skin redundancy necessitated scheduling her for a body lift procedure.